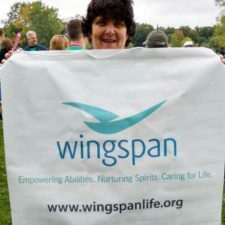 Client Profiles - Wingspan Life Resources Wingspan Life Resources | Empowering Abilities. Nurturing Spirits. Caring for Life. Michelle is a resident of Sheridan House. If you look up the definition of “Go Getter” in the dictionary, you might very well find Michelle’s picture! Michelle leads a full and busy life, yet she finds time to raise funds for her house during the annual Made in the Shade campaign. She is consistently a campaign leader, and has already raised more than $800 this year. She begins her campaigning early in the year and encourages her friends in other houses to do the same. Michelle is a wonderful ambassador. She approaches friends, neighbors, people at work, friends from church, and even people at her local baseball field. This year, she is raising funds for new dining room furniture for the house and toward new cupboards. She approaches potential donors in every aspect of her life with thoughtfulness, courtesy, and professionalism. Whether someone donates $1.00 or $100.00, Michelle is certain to let each donor know they are appreciated. If someone is unable to donate, she smiles and thanks them for listening anyway. She has many repeat donors who welcome her visit each year. Michelle keeps meticulous records and contacts the Wingspan Development Office each time she receives a new donation. The pledge forms are carefully completed and promptly turned in so that donors can receive thank you receipts in a timely manner. She takes great pride in her efforts and always has a goal in mind–a goal that is always exceeded. Michelle has been an active member in Wingspan’s Glee Club for many years. She is an enthusiastic leader and offers praise to her fellow Glee Club singers. She also enjoys going to karaoke night at the VFW and visiting with friends on weekends. Michelle goes to day program at Opportunity Partners and works at Arby’s. She enjoys basketball (“Go Lynx!”), and is active in Special Olympics and in her church. She has been a greeter at Wingspan’s annual Power of Love gala, and never hesitates to offer to help at any Wingspan event. Michelle enjoys coming to Made in the Shade every year and likes to help carry Wingspan’s banner as she walks with her friends. We thank Michelle for her enthusiasm and boundless energy, and for being a great champion for people with disabilities and for Made in the Shade! The Wingspan Life Resources mission is to help the people we serve to realize their own unique gifts, talents and dreams. We do that by empowering each individual’s to develop their own unique gifts, talents and dreams. Since Wingspan’s partnership with MacPhail Center for Music in 2013, more than 65 clients and staff have had an opportunity to participate. Glee Club has performed many times, including at Wingspan galas with such guest artists as Twin Cites jazz vocalist Patty Peterson, rock celebrity Kat Perkins, violinist/vocalist Gaelyn Lea Tressler, gospel virtuoso Robert Robinson, and folk artist/performer Rachael Kroog. 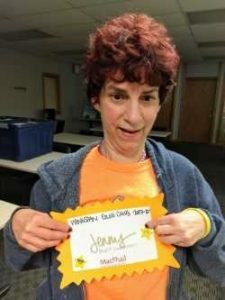 Today we’d like to introduce you to one of our charter members–Jenny from our Glenpaul House. Being a fun and vivacious young woman, it’s no surprise that Jenny loves to sign / sing and perform with Glee Club. Of the 20 or so current members, she is the only one who is Deaf and interprets songs with American Sign Language (ASL). At Wingspan’s Country Western Variety Show held April 8 at MacPhail Center for Music, Jenny interpreted John Denver’s “Country Roads” for the enthusiastic and appreciative audience. This free concert helped celebrate Wingspan’s 45th anniversary and also included guest performers The Lowland Lakers, an audience singalong, and an air guitar contest. Jenny also performed the song at the “Wingspan’s Got Talent” show in late April. “It’s really fun to be on stage. Everybody in Glee Club is really nice and we have a lot of fun together,” said Jenny who is 58 and communicates primarily through ASL, although she also reads lips and speaks. Jenny has made many friends in Glee Club! Jenny often helps lead the group in warm-up exercises including “beat boxing.” She is also the featured ASL soloist during concerts. Jenny always puts passion and hard work into her performances. She was awarded “Best Sweetheart” this season by MacPhail’s Music Therapist/Director, Colin Doherty. Congratulations to Jenny for focusing on her ability and for being a wonderful leader. Jenny works with Rise’s Day Training and Habilitation Sensory Support unit at the Spring Lake Park production facilities (we thank Rise for featuring similar excerpts in their online news). Her twin sister, Julie, is also Deaf and lives at Wingspan’s Colfax House. Julie participates in Community Involvement Programs’ MARI (Music, Arts, Recreation, and Inclusion), a nonvocational, retirement day service. In her free time, Jenny enjoys putting together jigsaw puzzles, working on her computer, and going for walks. Your support surely helps us to continue to empower abilities.